Getting your scythe to fit your own body is key to comfortable ergonomic mowing. Fitting scythes for others needs a bit of forethought and planning (particularly as I have found remotely by mail order). I recently faced the challenge of matching a scythe set up that was to be shared by a husband and wife: the husband 6’3″ and wife 5″10. Luckily it turned out that the wife had long legs for her height; so both had the same hip height measurement and could share a snath set up with minimal adjustment of the top grip. 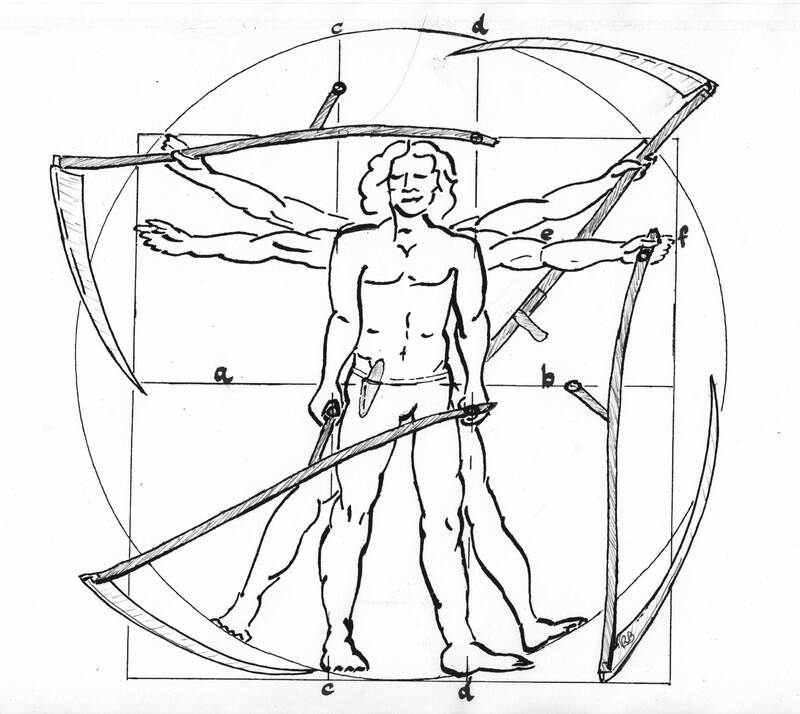 To prepare better for future fittings I decided to research more into the proportions of the human body – from the idealised form of Leonardo da Vinci’s Vitruvian man to the variety in real anthropometic data. A summary of my interpretation as relates to scythe fitting follows below. Line a – b is the hip line. The hip line is at the widest point of the hips (not pelvis or waist) where the outer end of the hip joint (greater trochanter – head of leg bone) can be felt close to the surface – it will move slightly if you lift your leg. For regular mowing the lower grip handle (at b) should be set to this level when the snath is stood vertically against the body. The hip line is also the central axis of movement, power and control of the body when mowing. The distance between the lower and upper grip handles corresponds to this so that the arms hanging naturally meet them comfortably. This measurement is also approximately equal to the distance from elbow (e) to fingertip (f) = one cubit. The forearm (e- f ) can be used to gauge the position of the upper grip by resting the elbow on the lower grip and fixing the upper grip to the first hole beyond the fingertips extended against the snath. With the scythe held vertically against the body and the lower grip against the hip the upper grip (at f) will be approximately 1 ½ times hip height – about the height of the arm pit. The feet are positioned at c and d for maximum stability in regular mowing. The outer square box frame (= body height and outstretched arm span) roughly corresponds to the width of swath cut in closed upright mowing styles. The outer circle drawn from the body centre (at navel) similarly roughly corresponds to the width of cut in open field mowing styles and is about 20% more than height/arm span. To mow freely with a wider reach you may find it more comfortable to open up these settings by moving the lower grip 5 – 7cm above the hip line and increasing the distance between the two grips by up to 10cm. The feet also move further apart in this more energetic style. In reality each person has their own conformation and style and should endeavour to tune their scythe to be in harmony with their body to make mowing as effortless and pleasurable as possible. Whilst the snath dimensions are to scale with the body, the orientation of snaths and grips to blades in the drawing are positioned for illustrative convenience (artistic licence with hafting angles and perspective). This entry was posted in Styles and techniques and tagged leonardo da vinci, snath, vitruvian man. Bookmark the permalink.